If you haven’t downloaded the Gluten Free Recipe Book PRO app yet, it would make a great gift for only $1.99 (around the price of a cup of coffee). Your favorite health nut will have over 200 gluten-free recipes including over 50 low-carb recipes right on their iPhone. Download it here. The Christian Prayer Guide App could help your friend or loved one develop a powerful daily prayer routine with 31 days of prayer prompts rooted in Scripture. Only $1.99 Download it here. Next, you can click through to a few of my partners who are offering specials to Gluten Free Homestead readers. Please Note: The links are affiliate links which means I will earn a small commission if you buy the item at no extra cost to you. These small sales are how I keep the site up and running. Thanks for your support! ButcherBox will give you $10 off + free bacon. You can’t go wrong with free bacon, right? ButcherBox (my full review here) is a subscription meat company delivering 100% grass-fed beef, free range organic chicken and heritage breed pork directly to your door. Get ButcherBox here. 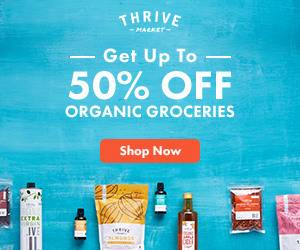 Thrive Market will give you 25% off + free shipping. Unlike the typical organic & non-GMO products that you might find at your grocery store that are marked up to premium prices, Thrive Market sells the same premium products at wholesale prices! Join here. Everything is on sale at Xtrema with free shipping on orders over $150. Xtrema All Natural Ceramic Cookware is 100% Ceramic for healthy eating and living. Experience pure taste, easy clean-up, no leaching, and unparalleled cooking versatility! Shop Xtrema here. After a lot of research, I purchased Sleep EZ mattresses when we moved to North Carolina. I’m very impressed with the quality and value of these mattresses and I think you will be impressed too. I’ll be posting a full review soon. Shop Sleep EZ here. Now, here are 25 top picks from Amazon.com that will delight your loved one or special friend. Click on each product photo to learn more. Food processors, mixers, and blenders. Oh, my! They come in a wide variety of colors and sizes and, thus, prices. Click through and find the perfect gift. Every healthy-cooking chef would just love a spiralizer, slow cooker, instant pot (I don’t have one, but they’re very popular with many of my foodie friends), or a citrus juicer. Snag one of these and make healthy cooking easier for that special someone. Below are some of the health and fitness products I love: Gamma Ray UV Glare Protection Amber Tinted Computer Readers Glasses, a BLU Energy Light, Folding Treadmill, Fit Bit, and a conveniently portable yoga mat. Encourage someone in their journey to good health with any of these choices. Do you know someone who’d enjoy making homemade sauerkraut or homemade yogurt? Here’s all the equipment they’ll need. How about a stylish apron? I’ve even included one for a child to help in the kitchen! Then be sure to pick up an essential ‘Ove glove that withstands temperatures of up to 540 degrees. I hope this collection inspires your gift-giving. Have a wonderful December and God bless!